This article will be used by teachers who wish to learn about School Loop's progress reports feature. There are two major types of progress reports, the traditional and the mastery-based progress reports. The default or traditional progress report is the system's default progress report and it includes all data collected by School Loop. It supports the use of point-based or percentage-based grading. Since the traditionally used grades are from A to F, School Loop allows numeric to letter grade conversions to be customized per course and even per student. Score Per Category: Displays current categories in use, percent score per category, and weighted percent of a category if weighting is applied. The mastery progress report supports the use of mastery-based grading, which is a system of evaluating students based on their demonstrated level of mastery of concepts. For this system, it may prove useful to hide the letter grade and/or percentage scores from the student's progress reports. Notes/Comments: Displays the custom progress report message. Customize the message to show a rubric scale. Current Summary Grade: Based on published grades. Last Published: Date and time when scores were last published. Assignment Category: Category for the assigned work or standard. Assignment Title: Title of the assigned work or standard. Score: Points earned on assigned work or standard. Notes/Comments: Displays the custom progress report message. 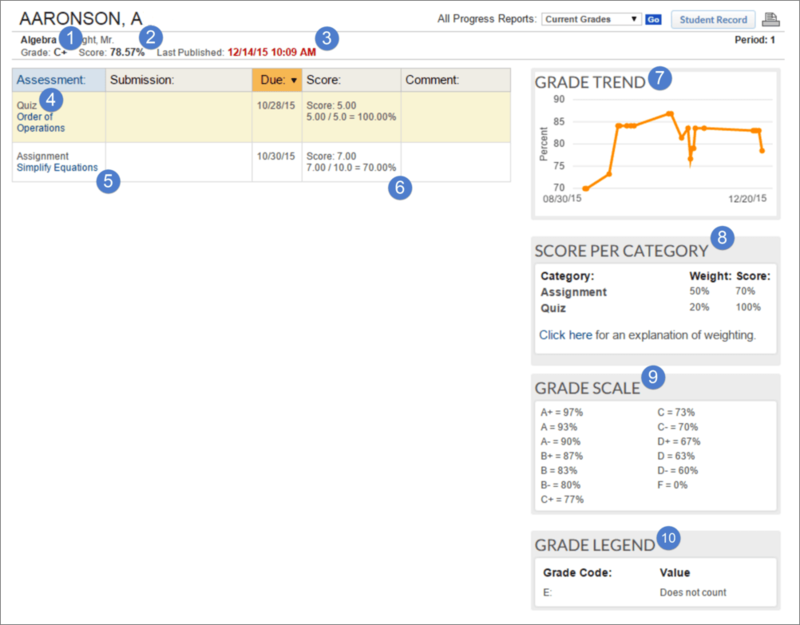 It can be customized to show a rubric scale. Grade Legend: Displays custom codes.